Avengers – Awesome BlingBlingBrick Figures! ONE OF A KIND: Handmade with compatible bricks, this Thanos Minifigure comes with a high quality, as seen in the movie LED light Up Infinity gauntlet that's handmade to just like the real deal from Infinity War! It's truly one of a kind and makes the perfect addition to any superhero figure set. LED LIGHT UP GAUNTLET: The infinity stone gauntlet is carefully designed to look just like from the movie and features 6 stones that light up when you connect it to the battery. It offers countless hours of fun and can be used as piece of décor as well! 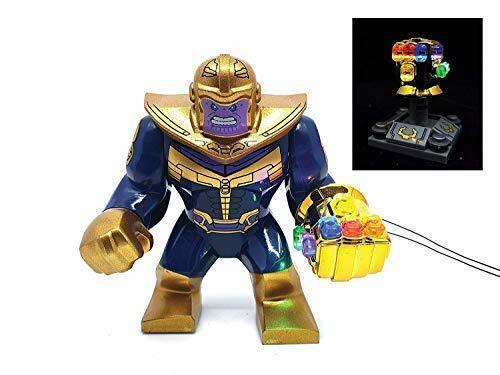 EASY TO CHARGE & USE: This superhero figure of Thanos with gauntlet lets you easily light up the 6 gems using the LR44 Battery Brick or the USB wire to keep it lit up on display while being compact and unobtrusive to ensure hassle-free use. GREAT GIFT IDEA: Looking for a great gift for friends or family that are big fans of Marvel movies? If yes, then you've found it! This Thanos figure with LED Light Infinity Gauntlet makes the perfect gift for every occasion including birthdays, holidays and more! 100% RISK-FREE PURCHASE: This superhero minifigure looks exactly like the image so that you know what you're getting. Each purchase is backed by our 14 Day Replacement Warranty so that you can order today knowing your purchase is risk-free. ONE OF A KIND: Made with compatible bricks, this Light Up Iron Man Minifigure (size 4cm tall x 1.6cm width x 1cm depth) comes with a high quality, as seen in the movie LED light Up armor that's handmade to just like the real deal from Infinity War! It's truly one of a kind and makes the perfect addition to any superhero minifigures set. LED LIGHT UP ARMOR: The Iron Man armor is carefully designed to look just like from the movie and light up when you connect it to the battery. It offers countless hours of fun and can be used as piece of décor as well! 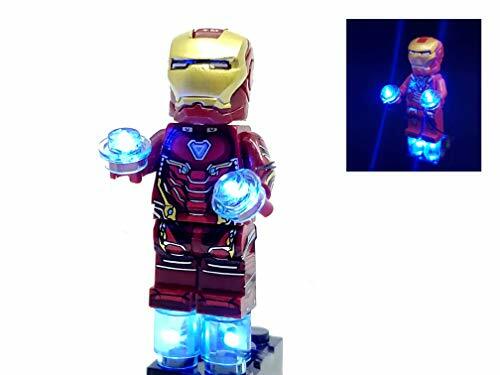 EASY TO CHARGE & USE: This superhero figure of Iron Man lets you easily light up the armor using the LR44 Battery Brick or the USB wire to keep it lit up on display while being compact and unobtrusive to ensure hassle-free use. GREAT GIFT IDEA: Looking for a great gift for friends or family that are big fans of Marvel movies? If yes, then you've found it! This Light Up Iron Man Minifigure with LED armor makes the perfect gift for every occasion including birthdays, holidays and more! 100% RISK-FREE PURCHASE: This superhero minifigure looks exactly like the image so that you know what you're getting. Each purchase is backed by 14-day return policy so that you can order today knowing your purchase is risk-free. ONE OF A KIND: Handmade with compatible bricks, this Dr Strange Minifigure comes with a high quality, the LED light Up effect that's handmade. It's truly one of a kind and makes the perfect addition to any superhero figure set. 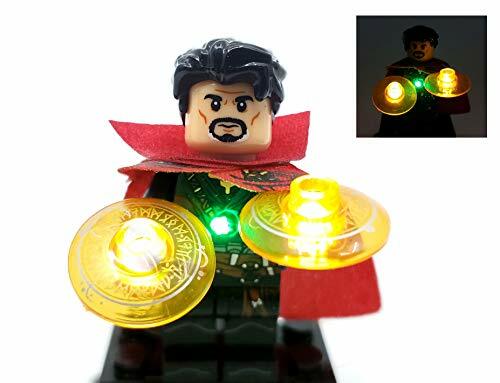 LED LIGHT UP EFFECT: This light up Dr Strange is carefully designed to look just like from the movie and features light up Eye of Agamotto and The Shield of the Seraphim can be light up when you connect it to the battery. It offers countless hours of fun and can be used as piece of décor as well! EASY TO CHARGE & USE: This superhero figure of Dr Strange lets you easily light up using the LR44 Battery Brick or the USB wire to keep it lit up on display while being compact and unobtrusive to ensure hassle-free use. GREAT GIFT IDEA: Looking for a great gift for friends or family that are big fans of Marvel movies? If yes, then you've found it! This Dr Strange figure with LED Light effect makes the perfect gift for every occasion including birthdays, holidays and more! 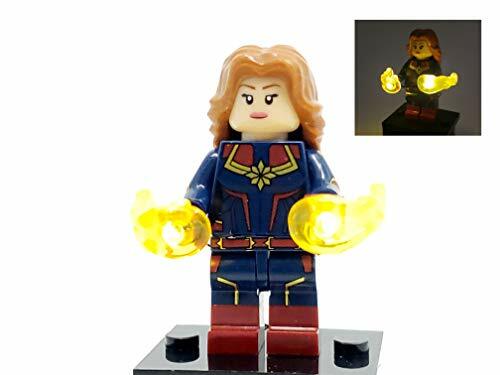 ONE OF A KIND: Handmade with compatible bricks, this Captain Marvel Minifigure comes with a high quality, the LED light Up effect that's handmade. It's truly one of a kind and makes the perfect addition to any superhero figure set. GREAT GIFT IDEA: Looking for a great gift for friends or family that are big fans of Marvel movies? If yes, then you've found it! This Captain Marvel figure with LED Light effect makes the perfect gift for every occasion including birthdays, holidays and more!